You can hear it. The muffled silence, the empty roads, something faint in the breeze like a breath held. 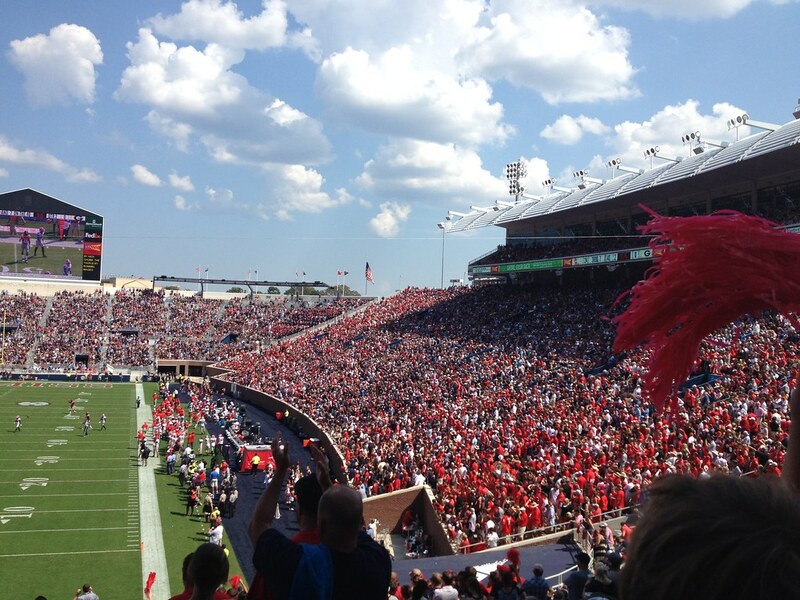 It’s a Saturday morning, and not just any Saturday: it’s Game Day in Oxford, Mississippi. 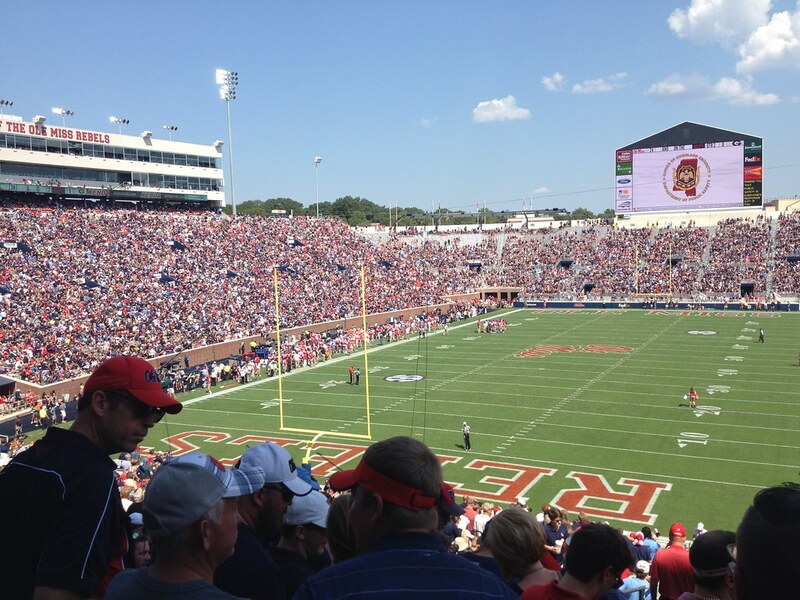 Game Day—any day Ole Miss, or the University of Mississippi, plays football—means a few things: an influx of fans often triples the town’s resident population of 20,000, sometimes approaching 80,000; the literal pre-game at the famed Grove, ranked by ESPN in 2016 as the #2 college tailgating experience in the United States; and, perhaps the most relished and coveted feature of Oxford: the Square. The old fashioned center of this Mississippi hill country’s frontier town, where people have congregated since 1837, is literally a square of storefronts around the stately white columned courthouse which the Union Army burned down in 1864 toward the end of the Civil War. Rebuilt in the early 1870s, Oxford’s Square remains the hub of social and cultural activity in the town. 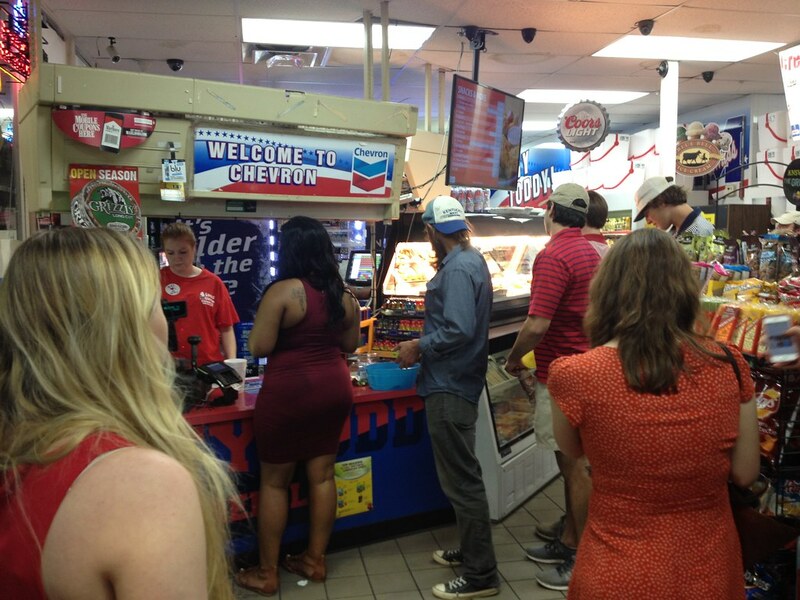 One quickly realizes Oxford is a place of traditions. Football is one of those traditions. Ole Miss will play Georgia today at 11:00 AM, an early game. Jessica and I pour a drink in a Solo cup (it’s legal to drink in public if your beverage is in a cup), and head out around 9:00 AM for the Grove. We’re soon walking through the Square. Old bars and storefronts feel, at this hour, more like art than what they are. We walk along the corridor of sidewalk underneath old wooden and iron-wrought balconies. These will be the pulpits from which tonight fans of the winning team will cheer and preach and proclaim, their voices hollow and hoarse, feeble against the bustling sounds of foot traffic and drunk talk on the sidewalks. We pass a couple walking in the same direction, dragging a cooler and carrying folding chairs. The man tips his cooler and cans of beer and chunks of ice are rolling into the street. He chases after them, breathing heavy already, already drunk. It’s 9:00 AM. We stop in at the only liquor store on the Square: Safari. Across the shop window reads “Hakuna Matata.” Here, you pay for the convenience of being on the Square, only a short walk from the Grove. I buy several airplane bottles of whiskey we’ll sneak into the game. Soon, we enter a stream of people heading to the Grove. The campus is closed off to traffic up ahead. 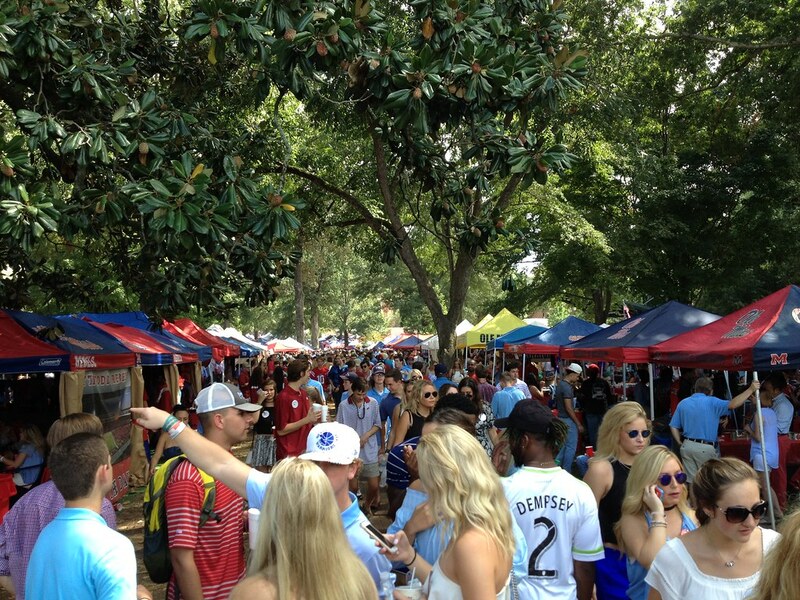 A sign high above the street reads, “Welcome to Ole Miss.” Tents spread out as far as you can see, and just as thick are the heady smells of cigars and stale, already, beer. The Grove. There are so many people you can’t see the ground. Women in lacy dresses and high heels. Men in shorts and sneakers, khakis and loafers, jeans and boots. The dust like a golden aura hanging in the air under the giant oak and magnolia trees. Tents, touching, some ornamented with chandeliers and silver platters of food and widescreen TVs hooked up to generators. Satellites speared into the ground. Our friend Meghan has invited us to her tailgate and to the game afterward. We don’t often go to games, because the tickets tend to be expensive (well over $50), but Meghan has season tickets. Every Friday night before a home game, at approximately 8:00, a police officer sounds a horn, and crowds joust for space in the Grove. In fact, even though it’s against Ole Miss policy, some lay out all day on towels or pay others to stake out coveted tent spots. For some, this is such a hassle they are willing to pay companies to do it. Meghan pays $1600 for someone to set up her tent all season. The price, per game, companies charge ranges from about $150 to $400. Many people who have tents consider this a worthwhile expense; they can keep their sanity. Today, Meghan has prepared barbecue, coleslaw, beans, and the best banana pudding I’ve ever had. We lounge in the tent and have a drink (beer is not allowed in the Grove, for some reason, but wine and liquor are; don’t ask me why) and wait for the initial crowd to go into the game. Soon after the game starts, the ocean-sounds of the stadium descend through the treetops and into the dust around us, followed seconds later by the sharp cheers from groups clustered around TVs. It can mean only one thing: Ole Miss has scored a touchdown. Then the cannon booms. Yep. Touchdown. “Hotty toddy!” Ole Miss fans yell. This is a phrase from the Ole Miss fight song, and it is often used to greet other Ole Miss fans. We hurry to the game, heckled by men flashing tickets for sale. The stadium looms tall, like a concrete tower. The women go in through one line and have their purses searched, the men in another. This is the test. But Meghan and Jessica have successfully concealed the liquor, and we’re now moving into the crowded backside of the stadium where a water station and vendors selling beer and food offer respite from the brutal heat: 95 degrees and humid. The Grove is an indication, but it’s not until you walk through any given entrance to the stadium that you realize that here, at Ole Miss, football is not merely a sport, it’s a nonnegotiable element of the culture. One must witness the spectacle of the Grove—idyllic yet hectic, pastoral yet tacky—followed by the awesome immersion experience of the stadium in order to begin to appreciate if not the culture itself at least the omnipotence of it. It is one of those things that seems to an outsider trivial, but for some reason, somehow, a spirit has permeated the game of football and it has become the medium of fanatics. Indeed, in a town like Oxford, where real estate prices are directly influenced by the success of the Ole Miss football team, it has become religion. We watch as Ole Miss demolishes Georgia, a win much needed after last week’s tough loss against arch rival Alabama. This game, quarterback Chad Kelly sets a record which seems almost sacrilegious because it outdoes Archie Manning. The record is for most consecutive games a touchdown pass has been thrown. In fact, Archie, father of Peyton and Eli (both NFL quarterbacks, like their father) is so beloved by Ole Miss that the speed limit on campus is 18, his jersey number. We watch today as Kelly plays a solid game, not only throwing touchdown passes but charging into the endzone himself. Ole Miss wins 45 to 14. But you don’t have to go to the stadium to have a good time. We often go to the Grove and retreat to the Square to watch at one of our favorite bars. Frank and Marlee’s (tucked back behind Proud Larry’s) is a cheap and festive option with a big back deck (and swings), a pool table and a basement where bands sometimes play. Pitchers of Pabst Blue Ribbon go for between $4 and $8, depending on the night, and the food is good for the price. The half pound Cowboy Killer burger for $9 and buffalo style chicken wings ($4 for a half dozen) are popular options, but catfish sandwiches and PBR-battered onion rings are among others. Frank and Marlee’s is nothing fancy, but if you’re looking for a no frills, everyone’s-watching-the-game atmosphere where bartenders all wear football jerseys, it’s a fun place to spend the evening without spending too many dollars. If you’re looking for a bar that’s a step up, a good option is City Grocery (above the restaurant by the same name). A watering hole where locals’ names are etched on plaques on the bar itself, this dark-wood room with casks and pews offering seats gives an old feel that brings people back. The balcony here has some of the best views of the Square. This is a classy bar that’s not too snooty where you can get a good wine or a sturdy drink from bartenders who know what they’re doing. After the game, the crowd swarms out and back to the Grove or to the inevitable destination for the night, the Square. The balconies are already filled, music pours out of bars. The drunken spirit of celebration seizes almost everyone. It’s only 3:00 PM, and there’s only one guarantee: the Square’s going to get crazy tonight. You don’t have to have much creativity to imagine what Oxford gets like the night of a game. And you don’t have to reach that point where thinking stops and the dark night unwinds and changes in front of you. So we decide to fight this rowdy spirit and take a look around town instead. See Part II for the rest of the weekend, including a look at Oxford’s arts scene. Getting There: Traditionally, the northern half of Mississippi has looked to Memphis as “the city,” and the southern half of the state at New Orleans. The Memphis International Airport (MEM) is one of the biggest shipping hubs in the country (FedEx is based in the city), but it’s a small civilian airport. This means often you’ll have an extra leg to deal with, but the size of the airport means you can land and leave within a half hour, including baggage claim. The airport is about one hour from Oxford, and downtown Memphis is about an hour and fifteen minutes. On the way to Oxford (if you drive highway 78 East to 7 South) you’ll pass Holly Springs, a small town famous for its beautiful antebellum houses and for being the home of blues hill country blues musicians like Junior Kimbrough. It offers a look at other Mississippi towns, similar to Oxford in space and layout but very different without the University of Mississippi as an employer. When to Go: Summers are very humid and very hot anywhere in the American South. This may be a reason for the slower pace of life than in many other areas of the country. Oxford, however, is a beautiful place any time of the year. With beautiful, warm autumns filled with football and changing leaves; winters that reach freezing but rarely involve snow; and slowly ripening springs when Ole Miss’s very good baseball team begins playing again, all provide their opportunities. It really comes down to the weather you desire and the money you want to spend. Where to Stay: Football weekends are fun, but they’re also crazy. It’s hard to stress how difficult it would be to find last minute lodging within walking distance of the Square, and forget about reasonable prices. People on Airbnb will charge about $600-$800 a night for an apartment (usually rented by groups who can split the cost) on game weekends. Even hotels exponentially increase their rates. Plan ahead. Look into Airbnb and motels months in advance. Oxford is a very pedestrian-friendly town, and it is recommended to see it on foot. However, if your budget is tight or you don’t plan to drink much, consider staying in Batesville, Holly Springs, or Water Valley, three small towns within a 30 minute drive. Prices are all about proximity; the closer you are to the Square, particularly if you can walk, the more expensive it’s going to be on a game weekend. Oxford in the off-season (non-football season) is peaceful, particularly in the summer and during the Christmas holidays. At heart, despite its increasing population, it has maintained its identity as a small town, and it feels this way. Lodging is very affordable on non-football weekends, especially in Airbnb rentals. Standard hotels and motels may be found in the area as well. The two best-rated bed and breakfasts in town are “The Z” (http://thez-oxford.com/index.html) and “The 5-twelve” (http://www.the5twelve.com/). Both beautiful houses within walking distance to the Square and the Grove, these would provide a lodging experience with more of a local, staying-at-home feel. Rates, at any place of lodging, will vary dramatically from the on to the off seasons. The Graduate, a hotel, is also a very conveniently located option. With a nice bar and restaurant (The Coop), it offers one of the best and only bird’s eye views of the Square. Great setting for a late afternoon meal or drink, even if you don’t stay there. Night Life: Bars close at midnight every night of the week except for Thursday and Friday, when they stay open until 1:00 AM. 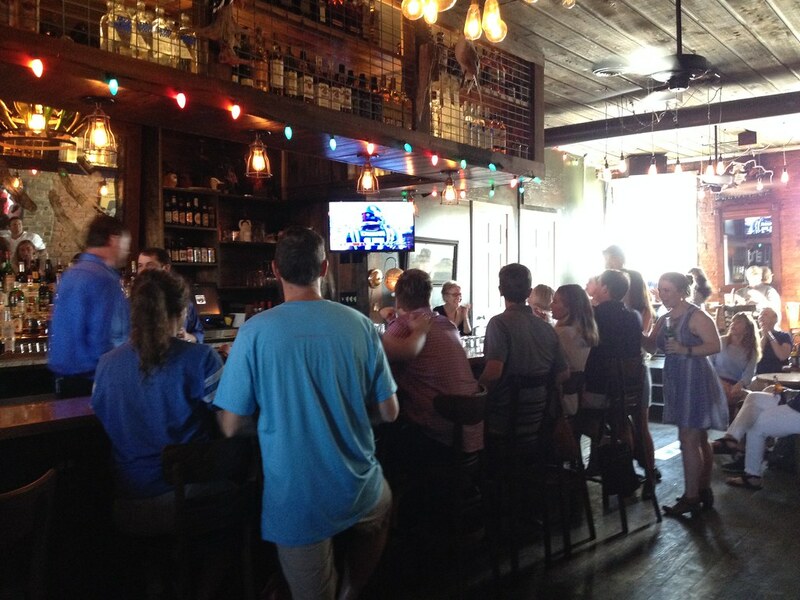 If it’s a game day (Saturday) and Ole Miss wins, the bars will stay open until 1:00 AM as well. After 11:00 PM, Old Venice Pizza on the Square closes its doors. Few people know, however, that if you walk into the adjacent Faulker Alley, there’s an unassuming door that opens into the back of the restaurant. This late night venue is called The Downstairs Bar, though some call it the speakeasy, because it offers absinthe, plays black and white movies on the screen above the dark dimly lit bar, and feels like 1925. The real draw, however, is inside a menu with a sketch of a raven on its cover and a slogan, “You were never here”: gourmet grilled cheese sandwiches for $12. Probably the most popular, and local, way to annihilate your munchies after a night at the bars is at the Four Corners Chevron gas station. Say “chicken-on-a-stick” to anyone or simply follow the inebriated pedestrians. If heading there around last call, expect to end up in a long line that winds through the aisles of the store and might reach out the door. Don’t be surprised if college kids who don’t want to wait in line offer you $20 to get them a pack of cigarettes or something to eat. And don’t be afraid to tell them to wait their turn. At less than $5, chicken-on-a-stick gives you massive hunks of fried chicken on a wooden skewer and your choice of sauce. You’ll feel great now, even if you won’t tomorrow. 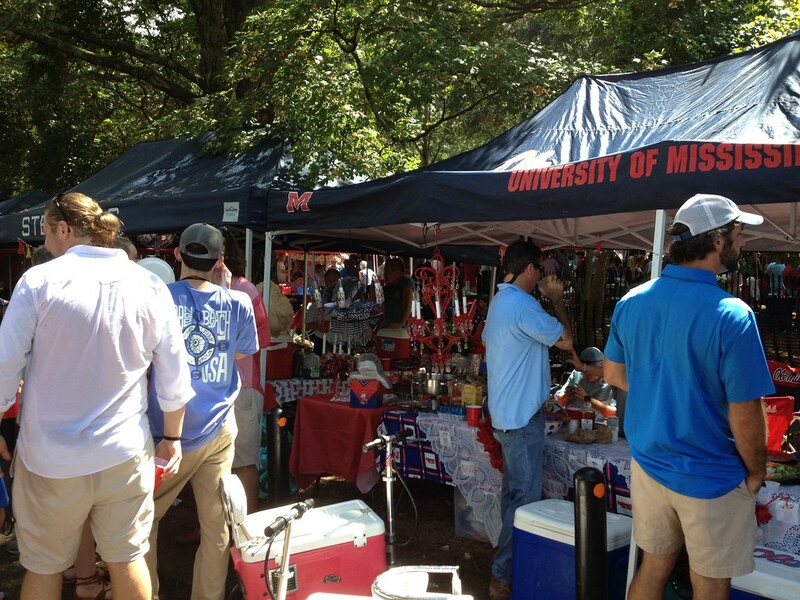 Although Ole Miss has lost football games, most Oxonians will stand by the claim that Ole Miss has never lost a party. Who the hell are we? Hey! Henry Wise is an American writer and English instructor at the University of Mississippi. He loves to spend the little money he earns on trips, has traveled in six continents, and lived for several years in Taiwan. An authority on cheap whiskeys and long awkward silences, Henry enjoys gardening and surfing, and lives next to William Faulkner's grave, which he visits regularly. He's gotten food poisoning in Cambodia, climbed a 90-foot rock face in Montana blindfolded, was badly sunburned in Chile sailing on a windless Christmas day in a volcanic lake, and is the worst karaoke singer Taiwan's immigration officers have ever allowed on the island.